Khachapuri - Every Georgian region has its own specific variety of this cheese bread. Khachapuri", bread baked with a seasoned bean stuffing. Especially eaten on the Georgian holiday of Barbaroba, or St. Barbara's Day (December 17). Pkhaleuli - Vegetarian dishes from a variety of plants, similar to spinach but each having a unique taste and seasoning. Among these are Jijilaka, Moloqa, and Ekala. Satsivi - Chicken or turkey in a walnut sauce. Lobio - Beans prepared with ground walnuts, various spices, vinegar, and olive oil. Nadughi - A dairy product similar to cottage cheese, but with a softer taste. Matsoni - A dairy product similar to plain yogurt, but somewhat more sour. 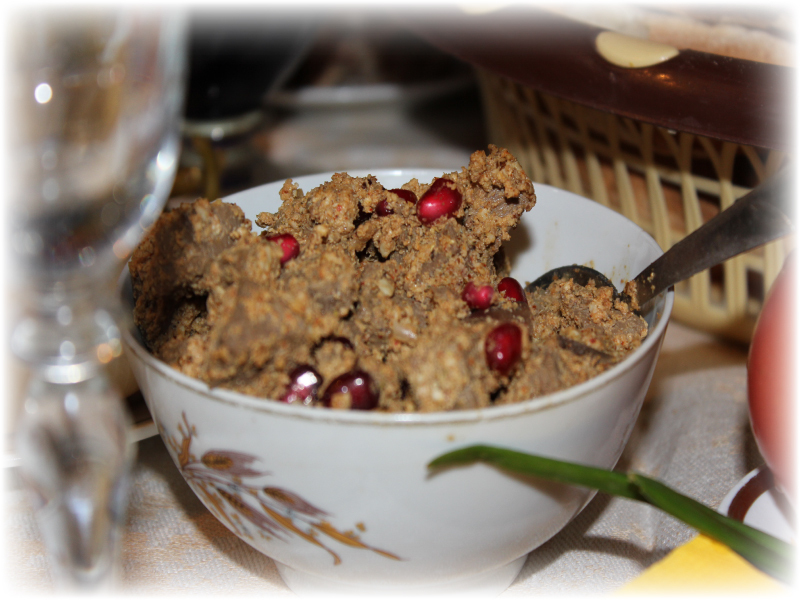 Badrijani Nigvzit - Eggplants seasoned with ground walnuts, vinegar (or pomegranate juice), pomegranates, and spices. 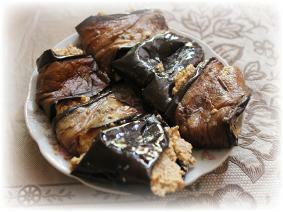 Ajapsandali - A vegetarian dish consisting of eggplant, potatoes, tomatoes, bell peppers, and seasoning. Soko - Mushrooms prepared in various ways, seasoned with herbs and spices. Ispanakhi - Spinach with ground walnut seasoning, herbs, and spices. Mchadi (cornbread) - Can be small and thick fried in oil, or thin and wide with crunchy surface.